Fireworks are a significant part of any 4th of July celebration. Some cities have regulations about individuals firing them off, so fireworks safety may not be as much of a concern. If your city doesn’t have these restrictions, you’ll want to know how to have a safe 4th of July fireworks display at home. Begin by learning about your city’s laws regarding using fireworks. Some places only place restrictions on personal fireworks displays if there is a fire hazard concern. Other areas will limit the areas where fireworks can be used. Checking with your city will ensure you know their requirements and restrictions and avoid any possible fines for using fireworks if they’re not allowed. It is also essential for all children to understand that they should not handle fireworks of any kind. They can be extremely dangerous if not handled properly. Even fireworks which seem harmless, such as snakes and sparklers, can cause serious injuries. Fireworks should only be handled by adults and preferably only those who know how to use them safely. Some adults enjoy drinking alcohol while celebrating Independence Day. However, alcohol and fireworks don’t mix. If the person who is planning the fireworks is drinking, it would be best to ask someone who hasn’t been drinking to set off the fireworks. Be sure to have a water hose, water bucket or a fire extinguisher nearby when using fireworks. One person responsible for acting as a firefighter would also be a good idea. This way you’ll be able to extinguish any flames or fireworks and be ready for emergencies. Stay away from the fireworks. With the possibility of catching on fire when lighting fireworks, you’ll want to “light and run,” so to speak. Don’t look into the fireworks tube to see what happens. Holding lit fireworks is also not recommended. Even though professional fireworks often include multiple fireworks going off at the same time, it would be best for individuals to light only one at a time. Rather than using grass or gravel, you’ll want to use fireworks on a hard surface which is flat and level. A sidewalk or paved driveway would be the best choice. Barring that being available, you may want to place a sheet of plywood down on which to use the fireworks. The more stable the surface, the safer the experience will be. Speaking about the surface used when shooting off fireworks, you’ll also want the area to be as open as possible. There shouldn’t be any trees or other obstructions in the way. The audience is also best kept as far away as possible. Never use glass or metal containers to hold fireworks when they’re being lit. 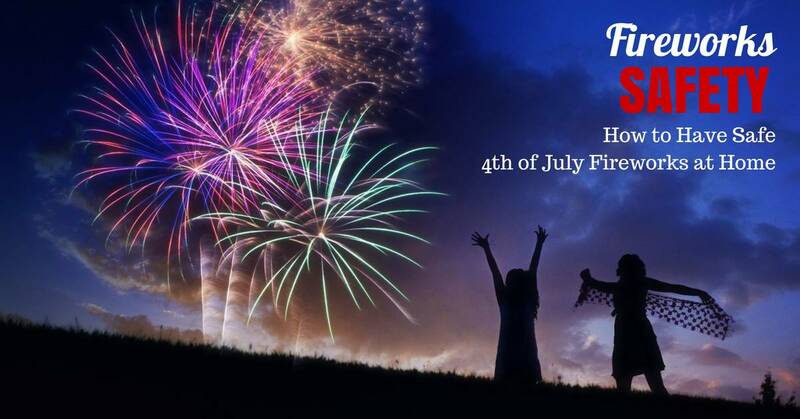 There are other fireworks safety ideas to be aware of, and they are typically provided in every package of fireworks sold to the general public. Take the time to read the instructions and fireworks safety standards the manufacturers offer. Don’t forget to use them once they’ve been read.